Today I'm revisiting a topic I haven't covered in nearly three years: iTunes folder monitoring. In an ideal world, Apple's music manager would be able to keep an eye on any folders you want, automatically adding to your library any new music it detects in those locations. Alas, even well into version 10, iTunes can monitor only one folder: the aptly named "Automatically Add to iTunes," which gets added as an iTunes subfolder when you first install the program. That means if you buy music from outside sources or rip CDs using a different program, you have to direct the song files to that folder -- or manually add them to iTunes, which is hassle-city. That's why I continue to be a fan of iTunes Folder Watch, a terrific utility that monitors designated folders (as many as you want), then automatically (or selectively) adds any newly discovered music to your iTunes library. What's more, new stuff can be automatically placed into designated playlists, thereby making it easier for you to find and play. 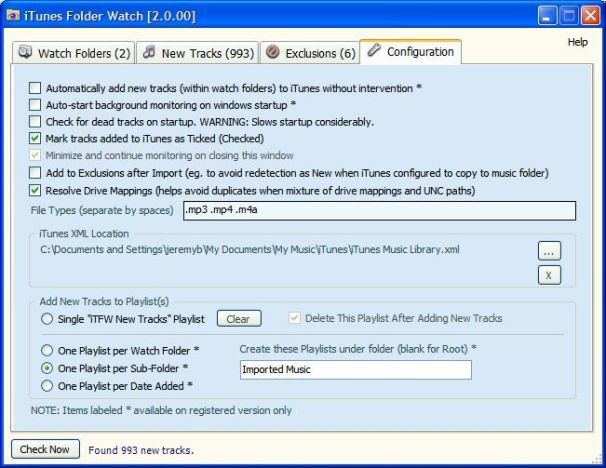 iTunes Folder Watch can be especially handy if you're working with a cloud-storage service like Dropbox or Windows Live SkyDrive; any songs you add to those folders from other sources will get automatically added to iTunes. The free version saddles you with nag screens and a few disabled features, but it gets the job done. You can get a lifetime license for 7.50 Euros, or about $9.40 U.S. That's money well spent, in my humble opinion.